More auspicious than delicious, shark fin is rubbery in both taste and texture. While its flavour is muted, a bowl of shark fin soup says plenty in traditional Chinese culture: The hosts have money and they’re generous enough to spread it around. But in Asia, the soup’s culinary home turf, the dish is increasingly regarded as, well, tasteless. Anti-finning advocates, armed with gruesome facts about threatened shark species, are attacking shark fin’s reputation as a status-boosting delicacy. Their mission: to see the culinary tradition die off before the sharks do. To many elders within China and the Chinese diaspora, a wedding without shark fin soup is like a New Year’s party without champagne. To some, the dish is so integral to business outings and big-ticket banquets that its absence suggests a snub toward guests. Even non-Chinese in Southeast Asia’s business classes have embraced the soup for its status-boosting properties. But the anti-finning camp is buoyed by a slew of major victories. Basketball star Yao Ming, celebrity royalty in China, has publicly urged China’s government to ban shark fin consumption. Last year, China’s Communist Party vowed to phase out shark fin soup from official functions. Taiwan, the fourth-largest shark fin market, has legally forbidden fishermen from sawing off shark fins and dumping the carcass overboard. The same rule applies to boatmen in European Union waters. State-controlled media outlet The People’s Daily, seen as a window into Party-line thought, backed the ban and lamented the deaths of endangered sharks. Both wildlife groups and China’s own officialdom contend that 95 percent of shark fin consumption takes place in mainland China, Hong Kong and Taiwan. But Hong Kong is the true hub with more than 22 million pounds of shark fin products imported into the city each year, according to Hong Kong government figures. Shark fin is singled as particularly destructive because fishermen often hack off sharks’ fins and wastefully chuck their carcasses into the sea. Unable to properly maneuver without fins, the sharks bleed out and sink to the ocean floor. The latest research into endangered shark populations, recently published in the journal Marine Policy, contends that a whopping 100 million, and perhaps up to 273 million, are killed each year. At this clip, several sought-after species — the scalloped hammerhead, the porbeagle and the oceanic whitetip — may not be able to reproduce fast enough to stave off extinction. The premier international body regulating the wildlife trade, the Convention on International Trade in Endangered Species of Wild Flora and Fauna or CITES, meets in Bangkok this month to decide whether to more tightly regulate their catch and sale. The resistance comes from Japan, a primary catcher of sharks and China, the primary consumer. Both nations have a vote in CITES and diplomatic sway over their trading partners, said Susan Lieberman, deputy director of international policy for the Washington, DC-based Pew Charitable Trusts. Popular sentiment on shark fin soup is difficult to gauge. 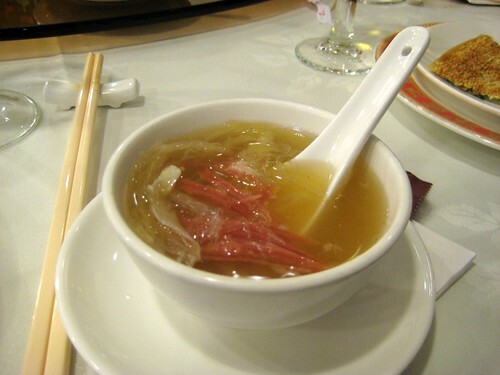 But according to a 2010 survey conducted by Bloom, a nonprofit devoted to ocean preservation, three-fourths of people in major fin soup market Hong Kong would “accept a wedding banquet menu that does not include shark fin soup.” Still, the same share of respondents, roughly 75 percent, had eaten the soup in the previous 12 months. In less-prosperous mainland China, the survey found that fewer than one in five citizens had ever eaten the soup in their entire lives. Depending on the eatery and the portion size, a serving can cost between $65 and $200. Among shark preservationists, the consensus is that eroding the market for shark fin soup in cosmopolitan Hong Kong or Taiwan may be possible. But in increasingly prosperous China, newly rich mainlanders with an appetite for the dish could offset these gains. In Bangkok, known as a city offering shark fin soup on the cheap, Jirayu and his fellow anti-finning activists have started pressuring hotel chains to pull the soup from their menus. A confrontational name-and-shame campaign is a last resort, said Jirayu, who expects quiet cajoling to prove more effective in face-conscious Thailand.